Susanna Leonard Hill: Would You Read It Wednesday - The 13th Pitch... And A Contest! Would You Read It Wednesday - The 13th Pitch... And A Contest! But before we get to Would You Read It, let me tell you about my latest contest plan. This is so much fun it will get you going even better than coffee and a donut! Are you ready? What is that noise in the dark of night? The Judge: (probably me unless I can talk someone else into doing it) will narrow down the entrants to three top choices which will be posted here and voted on for a winner. And now, allow me to introduce the lovely Tracy (known to readers of this blog as A2Z Mommy), a SAHM of three who lives in New Jersey and writes about food and kids for a hyperlocal news site http://MyVeronaNJ.com. Tracy has been published in NJ Family Magazine, and was a featured blogger for the NY Times Motherlode blog. She's in our Would You Read It spotlight today with her early reader pitch which was inspired by her son and his imagination. Tracy is looking forward to your thoughts on her pitch! OH! And please keep the votes coming for the book's journey book by going here and scrolling down to the poll! Many thanks! Maybe. If Pizza, Juice Box, Cake, and Cereal are all in the band together it would be fun to have a catchy band name / theme for them. Also, being interrupted doesn't seem strong enough wording for a conflict. I think being more specific about his bullying would help the pitch. I think your Halloween contest idea is awesome! How fun to hop around and read everyone's stories on that special day!!! This pitch right away said to me "amazing illustrations that will grab the children," because I think it would be fun for children to see these food items in a band, especially with a big brat bursting in on the scene. So I like the idea of food being in a band; however, the pitch didn't grab me as showing me a unique story. I think the first two sentences could go and the pitch could focus entirely on the plot sentence. What makes this story unique in terms of the plot? Why is the Brat such a threat? And if food items are the characters, is there a link between food and music? So I think I would probably pick this book up based on the illustrations of food items in a band (how cute and fun! ), and I think I would consider buying it if I saw the text presented some interesting twist in the plot :) It kind of reminds me a little of Veggie Tales and my girls love Veggie Tales! Randy and Kim - thanks for your comments for Tracy - I know she is waiting anxiously! Randy and Kim, thank you so much for your feedback. Kim- I'm with you. I can totally visualize this food-kids, and what I like about them is that they are all based on some of kids favorite foods- pizza, juice boxes, cupcakes, cereal, etc. No link between the kids being food and playing music except that human kids (at least mine) love to get together with play instruments and perform for adults. Randy- yes, I need to elaborate on what the interruption entails, which of course the story does, but this quick pitch did not. Thank you both for your comments. I really appreciate it. First off... the Halloween contest is going to be SO FUN! I am already loving it and can't wait to participate! Now for the pitch... MAYBE moving to PROBABLY! I love the idea and think it sounds so cute, but I think you could "spice" (yeah, pun intended - sorry) it up a little to really grab the agent or readers attention. I don't think it needs much. Maybe one catchy sentence would do the trick. For me... the cute illustrations could really glue me into this fun story idea. I would read the book because it's sounds funny based on the pitch. Abby - I'm so excited you're psyched for the Halloween contest!!! YAY!!! Love that pitch, especially the play on words bratwurst = brat. So glad your doing a Halloween contest. I'm such a ditherer about these things :P I'll help judging if you like. I'm very excited about the Halloween contest--it sounds like a ton of fun! I'm a probably for the pitch. The idea sounds like a lot of fun, but I had a hard time reading it. I had to re-read the second sentence a few times--maybe you could re-word it to make it flow a little easier? The third sentence pulled me in the best! I love a little stress! Sounds like a Halloweensie good time coming with the short stories. Before I say Yes, No or Maybe, I must admit that the names made me a bit hungry. But to whether or not this pitch worked for me, the answer is Yes. I like the idea of good friends having a good time and reading about the kid that stands up to the bad guy. What great ideas you come up with for your blog, Susanna! Your Halloween contest sounds like a lot of fun. About the story pitch--I couldn't get past the image in my head of the juice box getting slurped, or the pizza, cake, cereal, and BRATwurst (Great name) gobbled up by hungry monsters. But that's what supposed to happen to food, right? However, the idea of friends coming up against the worst brat bully is terrific. Inanimate objects as characters probably work just fine for t.v., but would be a tough sell as a book. Hi Susanna. The contest sounds like fun -- I will try it if I can find the time to write something! As for the pitch: A definite maybe. Even though the food band sounds fun, I'd want to see how this bully story stands out from the so many others that are already out there. I think this story sounds cute, and I'm always up for food products as characters (lots of fun to be had there) :) That said, I agree with a couple of others who noted that the plot (standing up to a bully) would have to really be portrayed in a unique way~ other than having the characters be food, which is original in itself, but might not be quite enough to stand out. Best of luck with this! I'm interested in the story from the pitch, as I love the fun character idea to share the bully story. Don't know what I'm doing with pitches, but Cereal made me take a second. Not sure that you need Cereal since he/she is not listed as a best friend. Might be able to use those words to add more to the bully issue. Thanks Tracy for sharing your pitch. I might be ready to submit by the time the series reaches 100. Oh, if I keep reading them I should be ready by the 50th one! I'm in for the Halloween contest and for Friday's foto! Clara, Andrea, Jess, and Stacy - thanks for your comments for Tracy. Thank you Clara, Andrea Jess and Stacy for sharing your thoughts and positive constructive feedback. It sounds like the characters speak to you all as much as they do to me and I really appreciate your taking the time to make suggestions! Have a great rest of the week. So many good comments. As far as the contest, I will try to submit if I have time. Sounds fun. As far as the pitch: it was an immediate yes but then I started reading the comments and have to agree the conflict just isn't strong enough to have a bully interrupt. What is he specifically doing to bully? Does he want to be a part of the band? Does he feel excluded? I like his name. I think that's a winner. But what exactly about him makes him the bully? The pitch: Thanks Tracy for being brave enough to share your pitch. It sounds like a fun story that would allow for great illustrations, but it feels like a little tension would help the pitch. I don't know what Bratwurst has done, other than shows up. Would love to know the rest of the story. Think your Halloween contest is a great idea! I can't believe the energy and creativity in this group! You certainly like to have fun! One quick question--are these nicknames of people or characters who look like the food name they have? I would say yes, I'd read the story to younger kids, cause it sounds cool and fun enough to keep kids interested. So the premises rocks. The pitch could use a little work though. The sentences seem disjointed... unrelated in some ways. For instance, what does Cereal have to do with the three best friends? The two sentences just don't flow together well. And because they don't flow together, Cereal's sentence causes a major break between the first and last sentence. Also, I'm not sure why Pizza needs to protect his friends from Bratwurst. An interruption really doesn't sound that bad. The last concern I have is who is the protagonist: Cereal or Pizza? I think it's important for a pitch this short to focus on one protagonist (show the dilemma from one perspective) even if the story centers around several individuals. Pizza can't wait to head to the garage and practice in the band with his best friends JuiceBox and Cake, not to mention check out the new guitar Cereal brought. But when Bratwurst arrives, snatching drumsticks and flicking guitar picks, Pizza must find the courage to protect his friends from the bully if the band hopes to jam again. Of course you know what the story is about. I just think a little more focus and specifics might help this pitch along a bit. Michelle, the characters mostly match their names. Kids who happen to be favorite kid foods. So, Pizza is a slice of pizza and Juice Box is a small square juice box. Cake is a cupcake. Cereal, I have not decided yet, and yes, Bratwurst/Brat is a big sausage. There are additional stories with characters named Cinnamon (who is a cinnamon stick and very spicy), Lemon Chiffon (who dresses and behaves just like she sounds) and Waffle, who has trouble making up her mind. The idea is that as an Early Reader there are five individual chapters, each with its own conflict, but characters, who are food, cross over from one chapter to the other. Pizza and Juice Box are the main characters though and present in each story. And, I'm not sure if I should do this, but maybe you all can help me. The conflict with the band practice is that Brat shows up in a bad mood (because he's moving) and he tries to take Cereal's brand new guitar. Pizza stands up to Brat and defends his friend. Should all of that detail be in the pitch? Would it make the pitch too long or too detailed? Thank you all for your contributions so far. I really appreciate it. 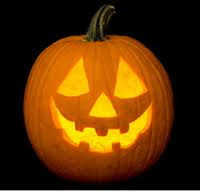 Looking forward to seeing all the pumpkin photos tomorrow! Hi Susanna, I'm very interested in your contest, how fun! I thought the pitch was great! I would definitely want to read what happens to the band. (only thing, for the cereal I wasn't sure if you need to have him listed as a "friend" or not) Best of luck with it! I'm posting on Jennifer's heels with the link to my Haloweensie post...then I'm going over to read hers! The jack o’ lanterns at the Barnes’ home were carved with cheerful expressions and a small flashlight inserted in each. No flamed candles were used. Mrs. Barnes was careful with fire—not wishing any young trick or treater to be burned. She had candied apples, just the right mix of sweet and tart, to offer each visitor. She wouldn’t even utter a “Boo!” determined that no guest would be frightened away. Trick or treaters flocked to the welcoming Barnes’ house—but never left.